Today on the old calendar, we celebrate the Elevation of the Cross, a “fast day” feast on which we remember the cross of Christ. We also celebrate the finding and raising of the cross by Empress Helen—wife of Constantius and mother of Constantine—who traveled to the Holy Land to dedicate churches on sites of Christian significance after her son legalized Christianity and stopped the persecutions. Christians went from a persecuted underground sect to the favored imperial religion, with the emperor’s mother piously devoted to replacing pagan temples with Christian ones. The feast functioned as the civil holiday for the Christian empires of Rome and, later, Russia. The troparion of the feast was the imperial anthem. Let them confess Thy great name, for it is terrible and holy; and the king’s honour loveth judgment. I have noticed over the course of my life increased Roman Catholic usage of Orthodox style icons. Of course, the West also once had traditional Christian iconography. A trip to the early Italian Renaissance section of your local art museum will show you just how late such iconographic tendencies survived in the West, with one last sudden blossoming after Greeks fleeing Turks settled in Italy’s cities in the fifteenth century. I have a quirky theory that accounts for the increased interest in icons among the papists. The common explanation, I believe, is that the use of icons is an ecumenical overture to the East—a gesture of cultural and spiritual goodwill. “See, we recognize the beauty and majesty of your ancient traditions, and we are happy to celebrate it ourselves.” I suspect that such ecclesial multiculturalism may have been the origin of the renewed interest in icons, but I think that Roman Catholics’ intra-ecclesial culture war has turned the ecumenical gesture into a matter of domestic tranquility. After the Second Vatican Council, Rome’s people experienced a turbulent ride. Odd forces were unleashed, from sources not entirely known, that sought to transform the Roman Catholic religion into something that it was not before. Modernist, Protestant, iconoclast, and even pagan influences became mainstream currents in the Tiber, at least as it flows in America. Not everyone took these changes easily, and, hence, there began the Roman Catholic culture war, which is still being waged. The controversies resulting from this war are legion, but some of them involve religious—and specifically liturgical—art and architecture. In this divisive climate, I propose that Orthodox style iconography has become an acceptable common ground for both parties, though for different reasons. The Roman renovationists, for lack of a better word, harbor deep hostility for their own tradition. They speak disparagingly of the dark times before the council (and they only talk about one council). Everything else is regressive, oppressive, and simply a perverse desire to live in the past (of dead white men, clericalism, moral self flagellation, catechetical fideism, empty ritualism, the Index, gaudy statues, and beaten house wives). However, the renovationists crave the new, and they tend to be, politically and culturally, of the multiculturalist Left. What is alien is familiar and dear; they find redemption in the “otherness” of foreign traditions. They also support ecumenism enthusiastically. After all, why should their own religion claim special status? That is so absolutist and anti-egalitarian. The Roman traditionalists, however, do not think that their religion popped into existence in the 1960’s. For them, the continuity of Roman Catholicism with the past is one of the things that they most value. For such continuity links them back to Christ himself and to the Hebrews before the Incarnation. Having a revulsion against modernity, they take solace that their faith predates the time of errors and confusion that they find in the secular world. They retain the classical sense of truth—for it is eternal and does not change. Why, then, should they be eager to see their religion change, as religion is a matter of truth? Given these two parties and their commitments, I ask you to see how Orthodox icons meet the needs and desires of both factions. The renovationists like icons because they find them foreign and exotic. Such modern, multiculturalists can glory in their broadmindedness and cosmopolitan tastes by admiring and adopting a religious art style that they find to be alien. Besides, the stylized aspect of iconography must appeal to their primitivist tastes. The man who likes African and Polynesian art is prone to like Byzantine iconography, as he has developed an aesthetic appreciation for the symbolic. The traditionalists like icons because they acknowledge their antiquity and the spiritual patrimony that comes with them. Having seen what secularized religious art has become in the West, they may have concluded that it would be better to go back to the source. Icons, therefore, are acceptable to both competing groups, and such explains their prevalence in Roman Catholic churches, hospitals, schools, and monasteries. On days following major feasts, the Church often celebrates people who are connected with the feast on what is called synaxes. 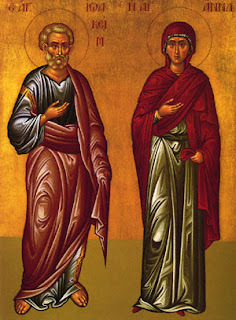 The day after the nativity of the Theotokos, we observe the the synaxis of the holy and righteous ancestors of God, Joachim and Anna. As I stated in my post on “The Nativity of the Theotokos,” Joachim and Anna are iconic grandparents for Christians. Their life is an image of their ancestors Abraham and Sarah’s story. For as Abraham and Sarah waited until old age to experience the miraculous conception, pregnancy, and birth of Isaac, thus orginating the Hebrews as a distinct lineage from Abraham, Joachim and Anna had the Mother of God in their advanced years—another miracle that announced a new birth—a new race—into the world. Yet, this time, the lineage would not be biological but spiritual—the kinship of Christ in the Christian Church. You may wish to read more about Joachim and Anna as well as to see some more wonderful icons on the Full of Grace and Truth web site. I especially like the first icon with the young Mary standing on the tree, which I assume is the tree of Jesse. For our sake you gave birth to the God-given Infant. From the house of David! Now Anna is no longer barren and nurses the All-Pure One! Who gave mankind the only Ever-Virgin Mother! 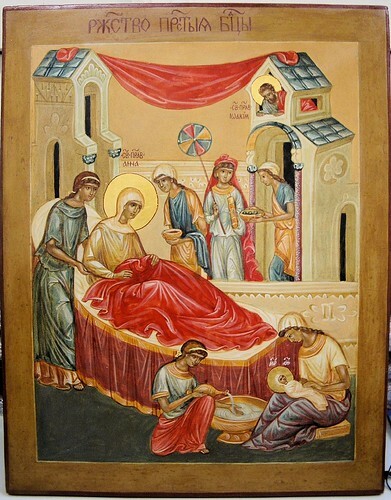 On the old calendar, today is the feast of the nativity of the Theotokos (September 8 / 21). Why do we celebrate the birth of the Virgin Mary to Joachim and Anna? Do you celebrate your mother’s birthday? Do you celebrate your friend’s mother’s birthday? Ought you not to celebrate your Lord’s mother’s birthday, who extends her maternal care to us all? I always like it when the priest ends his blessing at the end of the liturgy by invoking the intercessions “of the holy and righteous ancestors of God, Joachim and Anna and of all the Saints.” They are Jesus’ grandparents. Along with Abraham and the patriarchs, they are the iconic grandparents, though Abraham seems to me far more like a clan chief and a pater familias than a grandfather figure. Such is perhaps ironic, in that I am a descendant of “Father Abraham” but not of Joachim and Anna. Yet, spiritual descent has a vivacious presence in the mind of Christians, and Joachim and Anna seem so grandfatherly and grandmotherly. Some may find such sentiments sacrilegious, but I develop certain feelings for religious and other historical figures about whom I learn. I wonder what such men and women would have been like on a personal level. For example, for some reason, it always seemed obvious to me that Peter would be someone with whom I would feel comfortable. You would think that the preeminent apostle would conjure some sense of royal deference, but I have never felt that way. He just seems like such a man—a good man, a noble man—but very much a guy . . . like the perfect Boy Scout leader. He is the ultimate masculine friend . . . God’s wingman, to speak vulgarly but sincerely. In this, I do not wish to minimize the veneration that I have for Peter. I do not wish to sound like an egalitarian Protestant who causally speaks of the greatest heroes of the Christian faith like they were simply ordinary fellows. Nonetheless, I think that Peter’s leadership quality would be very much the type where you forget to feel conscientious and nervous in his presence. I think that he would have a disarming warmth rather than an icy majesty. Of course, these are emotional rather than intellectual observations about my own psyche, but I find it interesting. I wonder if anyone else feels that way. Thy nativity, O Virgin, has proclaimed joy to the whole universe! And Adam and Eve, from the corruption of death. The Nourisher of our life. I have witnessed Roman and Orthodox liturgies in many languages and in many lands. The one part of the liturgy that is always done well is the Sanctus. It is amazing that even in Roman Novus Ordo parishes that typically butcher the mass, they still sing this section soberly and beautifully. It is as if all the corruption in the world cannot taint its splendor. I do not know if liturgical Protestants have kept it well, but the Romans have managed to do so. The only other thing that American papists have safeguarded appropriately is when their priests pray, “Through him, with him, and in him, in the unity of the Holy Spirit, all glory and honor is yours, almighty Father, for ever and ever.” Most of the time, this beautiful pray compels our thoughts to the holy and sublime. Of course, it is a shame that only a small portion of the modern Roman mass remains, liturgically, quality guaranteed. Yet, with horrid songs like “One Bread, One Body,” what can one expect? I just looked up that wretched, awful, saccharine, Benji soundtrack treacle posing as a hymn, and it figures that a Jesuit—John Foley—composed the anti-tune in A.D. 1978. His Wikipedia article also notes that he wrote “The Cry of the Poor” the same year. I have never heard that song, but I already know that I hate it. Awful, awful, awful silly Jesuits and the madness that they have wrought! This entry is about the majestic Sanctus, however. It does its job of directing our minds to the transcendent. Here is the hymn in Greek and in Latin. Auster’s readers ponder why liberalism appears so prevalent in Protestant “evangelical” circles—a curiosity when we note that the evangelical movement arose as a theologically conservative (for Protestants, at least) reaction against mainline Protestantism’s modern slouch toward total apostasy. You may wish to read the short thread of “How Can It Be That Many Evangelical Christians Are Actually Liberals?” I found the anecdote about Lennon’s obnoxious song tragically funny. One of the posters mentions “Emergent and House Christianity.” I have no idea what those movements are, and I am somewhat content with my ignorance. Who can keep up with the constant lusting after the new in Protestantism? What ever happened to that “old time (meaning a couple centuries ago) religion”? As confused as they are, I’ll say this once again in support of the Baptists. They are untheological, and such anti-intellectualism has saved them time and again from these ridiculous fads. Like the Roman Christians during the theological controversies of the early Church, their lack of philosophical sophistication shields them from heresy. The difference is, of course, that the Baptists close mindedly defend an already tarnished belief system, and their characteristic lack of questioning that keeps them from modern apostasy also inoculates them from the truth—and thus from returning to the Church. In so many ways, our virtues and vices stem from the same sources. My contribution to the discussion follows what has already been posted. An insistence on sola scriptura inevitably leads to the unintended consequence of Protestants’ relying on contemporary culture and philosophy to flesh out their biblical world view. Such forces provide them with their hermeneutic lense and with the complementary values to the principles that they thereby gather from the scriptures. I suspect that this reason provides the foundation of Protestant culture’s movement toward secularisation and even paganization. When one does not avail himself of the tradition, he often indiscriminately grabs his supplementary necessities from aliens. Jumbling metaphors, such acquisition does not not slowly judge and then digest the spoils taken from the Egyptians—it does not “baptize” pagan culture and absorb it into the life of the Church—but rather it takes in a Trojan horse that brings the enemy within the city gates. As such, evangelicals have become liberals because the society in which they live is liberal. They breathe liberalism in the air, the ingest it in their food, and they incorporate it into their singing (even literally!). They can turn to no other source than the heathen, having separated themselves from the lifespring of the Church. A Protestant might object that the early Church did the same. My response would be that the early Christians carefully and consciously selected which elements of Jewish and Greco-Roman culture ought to be embraced by the Christian community. The theological controversies display the playing out of such selection. Moreover, I would argue that the early Church had definite advantages. For no other pagan civilization has achieved the level of truth and insight of imperial Rome. I do not think that it is an accident of God’s providence that Christianity emerged from its Hebraic seedbed when it did. The law of the prepared people became the gospel unto the nations when such nations were best able to receive the message. Their intellectual culture was shaped by Plato, Aristotle, Thucydides, the Stoics, and Plotinus. Our contemporary culture features Kant, Mill, Marx, Nietzsche, and the unmentionable postmodern twits who do not deserve to be named. As impressive as the second set may be, I think that the former comes closer to the truth. Even with the worst vices and excesses of imperial Rome, few people would question the natural order of the world. Today, the unofficial ideology of the West is that there is no such order; all is a matter of competing or cooperating wills. The Greeks and Romans had enough sense to despise the sophists. In our modern world, we reward sophists by making them our political and cultural overlords. By comparison with our contemporaries, Protagoras would be a sensible man in the academy of today. Even if you deny divine providence, the spoils of today’s Egyptians appear rotten next to the plunder that our Christian ancestors stole ages ago. 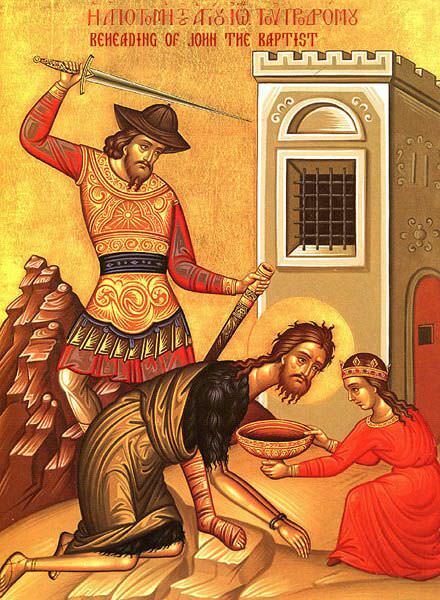 Today on the old calendar is the commemoration of the beheading of Saint John the Forerunner (Saint John the Baptist) by Herod Antipas’ wicked men. It is a fast day rather than a feast, and the somber mood fits the calendar day for Americans as we also remember the lives of those who died eight years ago in the barbarian attacks against our land. It is curious how a perverse sense of lust played a part both in John’s execution by Herod Antipas and in the suicide missions of the infidel Mohammedans. I doubt that many non-Orthodox people know that the only religious building to be destroyed in the attacks was the small Saint Nicholas Greek Orthodox Church next to the World Trade Center, which was crushed by the falling towers. My brothers and I had visited the parish one year before the attack as we toured New York. We spent a considerable amount of time in the World Trade Center that particular day. We wanted to see the city from the top of one of the towers during the day and at night. So, we passed several hours at the top, enjoying the spectacle of New York City from its southern peak as the sun set on the West. I remember our wondering what would happen if the buildings ever collapsed. We theorized that Wall Street in its entirety would disappear, so massive were the Twin Towers. We were wrong, but we never knew what horror would occur just twelve months later. When I have revisited the site since the attacks, I still think back to our time nine years ago. I dwell on Fritz Koenig’s Sphere. The globe shaped fountain once stood neatly in the plaza surrounded by New York’s wealth. Now, the deformed and maimed structure stands in Battery Park, a testament both to the awful destruction and to the perseverance of New Yorkers. I suspect that Schori here intuits correctly. I often find myself in an odd situation where I have to defend “progressive” folks. I am the extreme, right wing reactionary who thinks that the West started its road to perdition in the thirteenth century (not the Reformation or the French revolution or industrialization or the 1960’s). Why must I busy myself with excusing the enemy? Well, I am not excusing anyone, but I sometimes find conservative attacks on their political foes unjustified. The American Anglicans might have lost their minds in so many ways, but with each lapse of good sense, they may still offer isolated propositions that are true. In this example, Schori indulges in multiculti speak, offering the Bantu word, Ubuntu, as unadulterated, primitive wisdom. In this, she follows type; decadent Westerners have looked with naive longing toward their designated noble savages for centuries—a sort of modern version of the medieval fascination with Prester John. She furthermore distorts the insight that she does have by overstating the case. For we do exist as individuals, just as we exist as members of a family, clan, town, tribe, nation, language group, and so on. There is a level of reality of the individual human being that cannot be reduced or subsumed into other levels. Yet, Schori is getting at something, and her conservative critics appear unaware of the problem that she mentions. For it seems that modern, Western society is the first one that abstracts the individual out of the larger communal context in which most human life is lived. 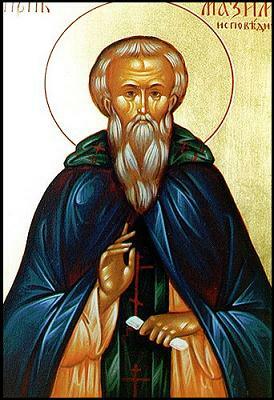 Of course, there have been ascetics and hermits who went into the wilderness to wrestle with demons and to run the good race, but they are few—and even they had to return to the cave to minister unto the blind who constantly sought to bother them with worldly concerns. Schori stated, “That individualist focus is a form of idolatry, for it puts me and my words in the place that only God can occupy, at the center of existence, as the ground of being.” I find no fault in this sentence or in the sentiments that lead to it. A certain form of egotism—of spiritual narcissism—animates the Protestant self-love evident in theologizing that, “Christ would have died just to save me alone.” Whether such is true or not, what sort of spiritual condition facilitates such thoughts? Last year, I wrote in “Those Jews” about my fascination with—and occasional annoyance at—rabbinical Jews, wherein I noted my Jewish heritage. Well, while I was home in August, I continued my local genealogical research, and I discovered that not only was my father’s mother’s mother Jewish but also that his mother’s father was a Jew. Hence, my father’s mother was fully Jewish ethnically, though her family appears to have been very secular. They were only interred in a Roman Catholic graveyard because of the demands of their granddaughter (I suspect quite uncanonically). Before learning this from the very same granddaughter (my father’s oldest sister), I had assumed that my Jewish great grandmother had married a Roman Catholic. Yet, it seems as if she married another Jew (who was born in the city that Jesse Jackson infamously described as Hymietown—New York City). Their daughter, then, was the one who married into the papist family of my paternal line (which is itself distantly Ashkenazi). Of my father’s siblings, only the aforementioned oldest sister remembers her mother’s parents. So, it is not remarkable, then, that my father knew little of his mother’s father. What I find curious is that no one in the family, of whom I am aware, maintained a Jewish religious identity. Rather, they all seem to have become Christians or simply nonreligious. In this, I think that the assimilation principle is at work. Unless one struggles to maintain the faith, one’s family will become what everyone else’s family is. Greek Orthodox in America largely resemble Episcopalians, American papists look and act surprisingly like liturgically minded Methodists, and there is no discernible cultural difference between most Reform Jews and W.A.S.P. bred Unitarians. The implied lesson for rabbinical congregations that applies just as well to Christian parishes is to hold the line and be comfortable being different, or your tradition will cease to exist. The implied historical outcome is that most future rabbinical Jews, like most future Christians, will be religiously observant ones. Nominal ties to a minority religious group in a secular society are not strong enough to maintain group allegiance or identification. Anyway, that is my latest Jew news: going from an eighth to a fourth Yid. I used to chuckle when I was described by others as an Aryan and Nordic standard, knowing that I was likely the least Aryan person in the group. I do wonder, however, how jewy one must be before one becomes a target for anti-Semites? Do I, too, finally get to jump on a victim bandwagon? And a Jewish one, at that; those carts have mileage!